Most distros has this package installed OOTB so you can skip this step. Configured OOTB in Linux Mint so you can skip this step. Add noatime mount option to all partitions except swap partition. So writing to swapfile/swap partition only occurs after RAM is filled 90% instead of default 60%. Good if you do lot of web browsing, video editing and gaming and do not want contents of RAM frequently written to swapfile/swap partition on SSD after RAM is filled only 60%. Enable write cache from Gnome Disks. That's a great exaggeration. 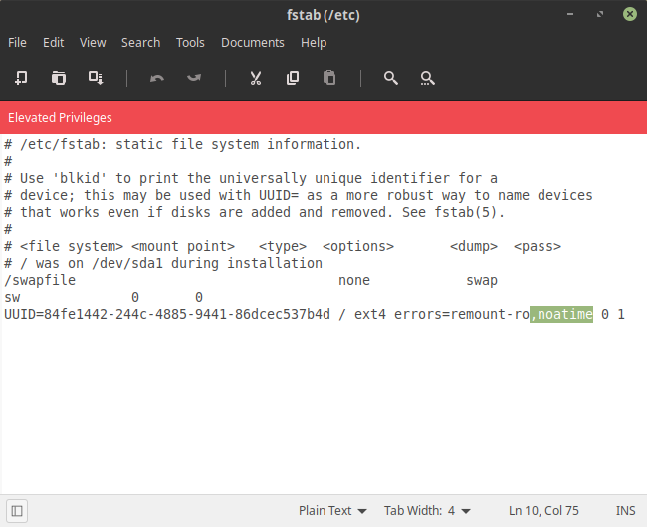 Linux Mint by default uses relatime, which only updates access time if the file is being modified (and thus the file information block would be rewritten anyway) or the previous access time is older than 1 day. Adding noatime leads to an insignificant difference in lifespan. I didn't know about Linux Mint using relatime by default. Don't use sudo xed, but xed admin:// instead. Good catch. I've updated it in OP's post. That parameter does not define a free RAM percentage (check the kernel sources, that parameter is used as part of a number of formulas, but none of them are about what you claim). If you decrease this value you'll probably see less caching and thus have a good chance of more disk activity, both depending on your use case. Write caching is enabled by default. On a desktop computer, you want swappiness to be as close to zero as possible. The reason you want to do this (even though it might hurt actual performance) is because this will immunize your computer to memory shortages caused by temporary big file manipulations (think copying a big video file to another disk). Do try this with a present day kernel. He even provides a test script. I think you'll find it doesn't behave the way he experienced it back then, I know it doesn't on my laptop at least. That aside very nice article. Last edited by gm10 on Thu Nov 08, 2018 3:02 pm, edited 2 times in total. To try this with a present day kernel. He even provides a test script. I think you'll find it doesn't behave the way he experienced it back then, I know it doesn't on my laptop at least. That aside very nice article. Can you perhaps give some links that elaborate on this change of the kernel's paging strategy? ...at least on my own laptop, i do find that the default value of 60 makes it crawl from time to time (also, article is last modified June 2013). exactly what do people do in their 'desktop' to somehow need to achieve a longer SSD lifespan? unless of course it borks out of the blue one morning, which can happen with any digital device. Also ancient but still more recent than 11 years ago. More elaborate than the Arch wiki, yet simplified enough to be understandable for me. I noticed that on your older https://sites.google.com/site/easylinux ... forxubuntu I'm getting a 404 error nowadays. ? 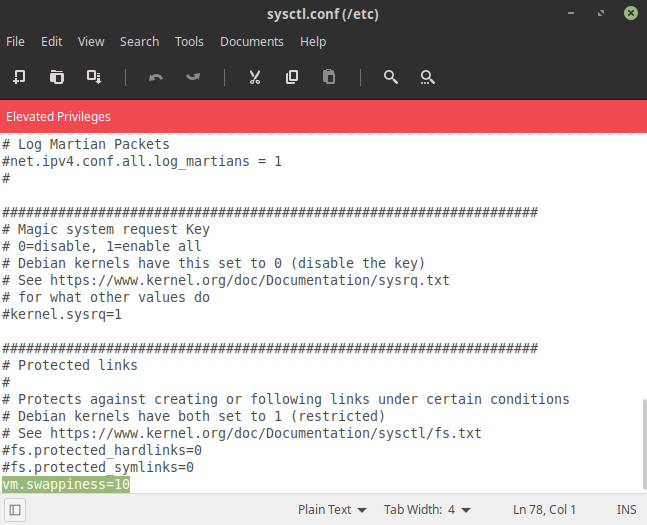 Is this: https://easylinuxtipsproject.blogspot.com/p/1.html your new tutroial tipsntricks for LinuxMint? Anyway, your older tips for LinuxMint on sites.google.com was a very handy site for me. Just wanna say a big thanks for all that too, meaning, I hope you keep it up. Is this: https://easylinuxtipsproject.blogspot.com your new tutorial tipsntricks for LinuxMint? Everything has been moved to my new site, so no information has been lost. Increase your RAM size to 8 or 16 GB and you'll need swap only as cheap extend of real RAM for the rare case that existent RAM needs to be extend a bit. Current SSDs have in default less live time than the best existent server drives. They run with guarantee more than 5 years 24h 7d/week. Ony 3 or more years old SSD may have noteable livetime when they get constantly switching power on/off. Never by writing to it.